Ranchero Script from the 2014 Cool Cruise. Beautiful old town setting for this classic car show. The Woodies are at Dana Point April 27, 2019. Great day to spend at the beach. Beautiful classic car show at Johnny Carson Park in Burbank. The classics sit on the lawn for a pretty little setting. Hours are from 9-2. Lots of parking and entertainment. Jake loves this show, it’s on the lawn and Burbank has water fountains for pets. One of our favorite car shows, The Road Kings at Johnny Carson Park. Taking The Ranchero & the Blue Q, along with meeting up with the So Cal Falcon Car Club for a day of fun. Jake loves this show, it is on the grass, lots of shade and the park has water fountains just for dogs. Beautiful car show setting at Santa Barbara City College. The Belmont Shore Car Show lines the city streets. This classic car show has a wide range of classic cars. Best to get there early, it can get crowded. Dog friendly but there are a lot of dogs so if yours isn’t friendly think about keeping it at home. Bring water it can get hot. If you are looking for a car show this one is not to be missed. The Fabulous Fords Forever Car Show is now at Angel Stadium April 14, 2019. Entrance and Parking is still free so check out their website for any info needed about the show. One major change No Dogs! Jake will be sad to hear the news. Pomona Swap Meet is April 14, 2019. Get there early is can get crowded. This show has it all, local vibe, ocean views, amazing pier setting and classic cars. Jake loves this show, don’t forget to bring water, this show is at the beach but is does get hot. The Grand National Roadster Car Show is all about one of the most iconic car clubs. This show has it all roadsters, lowriders, pinstripers motorcycles and more. Friday is usually the lightest day but it is always best to get there early, it gets crowded. Saturday the outside rides show up. Check out their website for all information and parking details. Line up starts at 7. This classic car run is all about finding the shops. First show for 2019 car show season. The Pomona Swap Meet has all the class a classic needs. From vintage finds to swap meet needs cat this car show and enjoy the rides. If you love classic cars, great architecture and the ponies then the Road Kings at Santa Anita Park is the perfect setting. From 8-5 check out the rides. The So Cal Falcons are putting on a show, come and join in at the LA State Historic Park, admission is free. We are bringing the Ranchero and the Blue Q and can't wait to see the line-up of Falcons and Rancheros. Click the flyer above for more info about the show. Check show hours-not listed on their site at time of this post. Great neighborhood car show. Get there early to beat the crowds. This car show gets crowded and hot. Dogs are everywhere so keep yours close and bring water. It is pavement driven so their pads can get hot during the warmest part of the day, there are water bowls for dogs at some of the local shops and plenty of water sources with vendors that line the street. This car show has a broad range of classic autos. The Downtown Burbank Classic is city driven with the classic neighborhood vibe. There are shops, restaurants and bars. The show starts at 3PM and last till 9PM. It is on the streets so if you bring your dog remember the pavement gets really hot, so watch their pads and bring lots of water. Remember if you bring your dog the pavement is really hot so go in the evening not afternoon and brings lots of water. 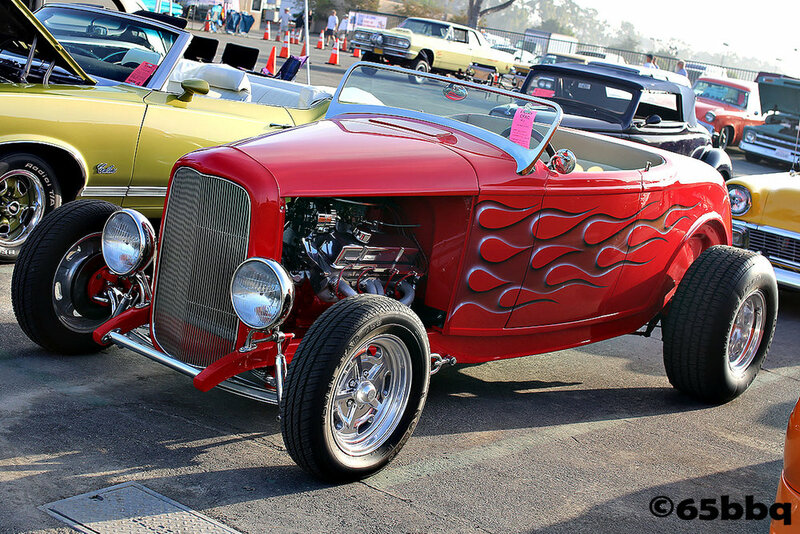 The Roadster Show & Swap Meet is two days of fun. Classic roadsters line the outside fairgrounds. The swap meet side is huge. It gets hot as the day progresses so bring sunscreen and a hat. The Road Kings are taking over Johnny Carson Park June 10, 2018 and we are bringing the Ranchero and the Blue Q. Join in all the fun with one of the oldest car clubs in America. This is Jake's favorite car show. Lots of rides and a lovely grass knoll to lounge on. Park is dog friendly with water fountains for dogs in the park. Grass-lined car show features the LAPD and classic cars. Wonderful assortment of classics and the police department showcases some very fine rides of their own. Mustangs on the lawn at Warner Center Park. Great family fun. The Rancho San Antonio Boys Town Car Show is a classic for Chevy's but there is more to this show than just Chevy's. Catch the fun. They line up in the parking lot at Doheny State Beach. Get there early and enjoy the cars and the wonderful beach sites nearby. Some fabulous Woodies showcase this show. This is a pavement car show so bring water, it can get hot. No dogs on the beach. The Fabulous Fords Forever is on April 15, 2018 this year at Knotts Berry Farm. If you are looking to find the Ford history-line this is the car show to attend. From Rancheros to Race cars this car show is one of the finest in Southern California. The car show is free and dog friendly but it gets really hot because it is pavement related so if your bring your dog bring lots of water. For a look at last years show click the pic. Jake's reminder: If you bring your dog have plenty of water and watch their pads it gets really hot at this car show. Veteran's Memorial Park Culver & Overland Blvd. The La Verne Cool Cruise is the perfect location for an old town car show. Classic cars line old town La Verne for a great display of rides. Perfect for family and pets. Music and lots of shops and restaurants. Check out past shows just click the pic above. The Beachcruisers Meet is a great car show especially if you love the Woodie Classic Ride. This car show is in Huntington Beach along the pier. It is a wonderful opportunity to check out this beach city and classic rides. We will be taking The Ranchero and the Blue Q to the show on Saturday, so stop by and say hello. Click on photo of the Woodie Classic Plymouth above to check out past car Beachcruiser Meets. The 2nd LA Classic Auto Show is showcasing some very fine rides March 2-4, 2018 at the LA Convention Center, South and Kenta Halls. This is a wonderful look at history. Show dates are Friday March 2, 12-8, Saturday March 3, 10-8 and Sunday March 4, 10-6. The show has a wide range of pricing for admission so check out their website for ticket pricing. The top car show in the country is The Grand National Roadster Car Show. This show is one of the finest car shows with roadsters, car clubs, motorcycles and more, not to be missed. Get there early, it gets crowded. Friday is a great day to start but the outside rides do not show up till Saturday so go all 3 days and enjoy the rides. Friday January 26, 12-8. Saturday January 27, 10-8 Sunday January 28, 10-6 Tickets $25.00 per day, Age 6-12 $10.00 per day. Kids under 5 free. Parking at gate 9. $10.00. Click pic to catch last years show. The Motor 4 Toys showcased classic cars and exotics. Bring a toy and get there early it can get really6 crowded. The Road Kings take to the infield. One of our favorite car shows. Cruisin' for a Cure car show is worth the admission. This car show is truly for a cause, cancer. Not only can you see some fabulous rides, there is music and vendors and a great crowd lining the fairground cruise-a-rama. Find out more about this great car show with a cause here. Admission price is $15.00 AAA card holders $13.00. Kids under 12 get in free. Parking is $8.00 at the fairground parking lot. Click pic above to check out last years show. The Belmont Shore car show is the perfect location for a classic car venue. Classic Cars line the neighborhood streets with restaurants and shops and vendors showcase their wares in the middle of the roadway. This is a great family friendly affair. This is also a big dog friendly car show. Seriously, dogs everywhere so bring water and be aware, we have seen dogs not too happy to meet up with each other at this show. Back to the rides. This car show has a broad range of classics. From this 50's Ranchero above to the amazing hood mascot below. Get there early, it gets really crowded into the afternoon. There is a lot to find at the Pomona Swap meet. Get there early! Bob's Big Boy in Burbank is having a preview Friday August 4, 2017 from 5-9 PM. The Downtown Burbank Classic has quite the showcase from classic cars to movie cars. Perfect downtown setting. Will be warm outside so if you bring your dog, please have plenty of water or head out to the show in the evening hours.